The New School’s Greenwich Village home is a great place to shop, eat, catch a street performance, or just people watch. But could it be just as great a place to plant a row of herbs or harvest a crop of tomatoes? Increasingly, the answer seems to be, yes. As the world’s population increases and urbanizes, scholars and farmers are realizing the agricultural potential of cities. The New School’s focus on interdisciplinary research has allowed the university to emerge as a leader in the study of urban food production. The New School’s many projects related to the topic as well as urban farming innovations from around the world are showcased in depth in the exhibition Living Concrete/Carrot City, which runs from October 1st through December 15 at the Sheila C. Johnson Design Center at Parsons. A union of two exhibitions, Living Concrete/Carrot City presents a global survey of developments in urban agriculture and food production set in a context of civic engagement and participatory design. 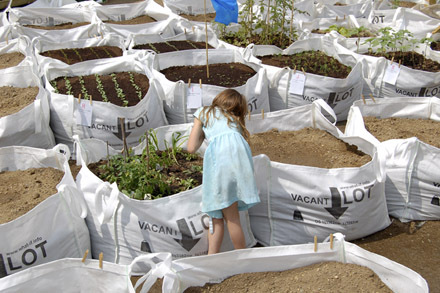 Living Concrete, which originates at The New School, focuses specifically on how design interventions related to food production in New York City are influenced by a combination of community involvement, political action, and service design innovations. Highlights from this section include a field guide, to local foods on the Lower East Side; a project that reimagines neighborhood bodegas; and a multimedia presentation examining Milano professor Dennis Derryck’s Corbin Hill Road Farm CSA, in which South Bronx families buy sliding-scale, affordable shares in an upstate New York farm. Living Concrete’s local focus is placed in dialogue with partner exhibit Carrot City, which comes out of Canada’s Ryerson University. Carrot City showcases global design solutions to make urban farming more accessible, including grow bags, and grid systems that can be filled with soil to create a garden on any terrain. This exhibition is about more than just the ability to grow food in cities; it is about the social interconnections of the people involved in food production,, says Cohen, who co-curated the exhibition with Radhika Subramaniam, director of the Sheila C. Johnson Design Center. This theme of interconnection and the exchange of ideas will be put into action in the exhibition space, which will double as a platform for public pedagogy., Cohen will lead students through a research project that will map out New York City’s food system, identifying interesting patterns in food production, distribution, and consumption. The SJDC will also host a roster of public programs, including Food Design and Social Change, (Oct. 6), featuring several New York City urban agricultural leaders; and the launch of Robert Gottlieb’s new book Food Justice, introduced by Majora Carter (Oct 14). Other speakers will include Erika Allen of Growing Power, Stella Chao from the Seattle Department of Neighborhoods, and Gabrielle Langholtz of Edible Brooklyn and Edible Manhattan. For the full schedule of events, please visit the SJDC website.